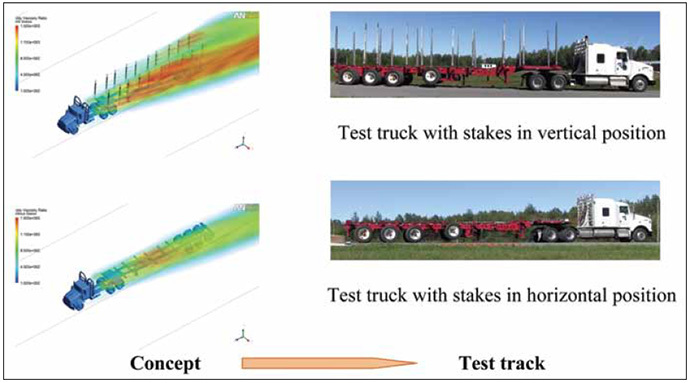 FPInnovations’ research shows reducing forestry truck fuel consumption is possible with aerodynamic modelling. With funding from Natural Resources Canada, FPInnovations was able to initiate research and develop several concepts for reducing the aerodynamic drag on trucks, thereby improving the fuel efficiency of tractor-trailer combinations used in the forest industry. The concepts were analyzed using computational fluid dynamics (CFD) and the most promising concepts were tested in Laval University’s scaled-wind tunnel. 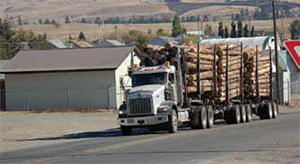 The concept that showed the most potential to reduce drag and fuel consumption was identified to be folding down the stakes of an unloaded log truck. This was further validated during FPInnovations’ fall 2013 Energotest campaign at the Transport Canada Motor Vehicle Test Centre test track in Blainville, Quebec. The concept was shown to have the potential to reduce aerodynamic drag by 28 per cent, for a fuel savings of 14.6 per cent. Over the course of an entire year, this could translate to a fuel savings of up to $3,400, with a greenhouse gas emissions reduction of up to 8 tonnes (per trailer). As a next step, FPInnovations will work with trailer manufacturers to develop prototype foldable stakes or bunks that can fold into a horizontal position in unloaded conditions. The design will include operational and safety features while maximizing the potential fuel savings. Does your company have an idea for a new engineered composite panel product, want to test an existing product for its potential use in new applications, or evaluate its ability to supply a new market? Alberta Innovates - Technology Futures (AITF) operates one of the world’s only commercial-scale panel production plants—and contracting the services of this research facility could help fast track an idea from the drawing board to the marketplace. The pilot plant is located at 250 Karl Clark Road in Edmonton, Alberta. According to Grant Reekie, AITF Pilot Plant Coordinator, the Tech Futures’ facility also provides an opportunity for panel producers to conduct research and development in a controlled environment without interrupting production at their own facilities. AITF offers two types of services to its clients. One is a fee-for-service contract where the customer provides their own raw material and recipe, and uses the Tech Futures plant and employees to test various panel production and performance parameters. The second is where the customer has an idea for a panel product, and AITF’s in-house technical staff develop a product design and production model to deliver a product based on the client’s needs, using the pilot plant to test and verify the product’s performance parameters. The Tech Futures research facility consists of an entire production line typically used within most commercial engineered composite panel production facilities, with the capability to produce a 4’ X 8’ sheet to a maximum of 6” thickness. It can reproduce any panel product commercially available today, with the equipment designed so it can be retrofitted to prepare the raw material to customer specifications. The production line consists of raw material processing and screening, resin and raw material blending equipment, a forming line with adjustable orienting heads capable of delivering a wide range of raw material, and a panel press with steam injection capability to cure the resin right to the mat core. The pilot plant also houses a wide selection of in-house panel testing equipment to evaluate material to any international standard. As part of its service, Tech Futures provides the technical staff to operate the line. They have considerable accumulated experience working with a wide variety of raw materials, resins, and pre-press and press parameters to operate the production line under the client’s supervision and to their specifications. AITF is also noted for keeping its fee-for-service work completely confidential. Tech Futures offers its facility and services to industry, other research and technology institutions, and government clients anywhere in the world. 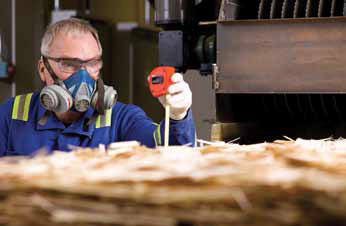 For example, AITF has an agreement with FPInnovations, Canada’s forest products research institute, to support its engineered wood panel product research program. AITF’s in-house technical staff also work within a consortium of panel producers to address specific issues that members might be experiencing, with the research results shared with all members. 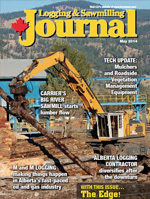 Rob Wellwood, AITF’s retired forest products branch manager and currently a panel product consultant, says there is considerable potential for the development of new engineered panel products. This is particularly the case in appearance applications in the Asian market, considering that China alone built about 17 million homes in 2013. The most the U.S. has ever built in one year is about 2.2 million homes. Tech Futures is eager to work with its clients to conduct the product development and performance testing they need to potentially supply this huge and growing market. For example, it has already helped clients develop a new product that functions as a core for panels used in decorative applications, with China being the target market. AITF also helped to develop a panel that is being used successfully as a core material in the manufacture of shipping container flooring, also aimed at Chinese customers. Alberta biodiversity researchers want to find ways to minimize the impact of seismic lines on wildlife populations. Given the high level of resource exploration and extraction activity taking place throughout Alberta—and a population expected to grow by 40 per cent in 20 years—the province’s landscape is changing, which may have an impact on biodiversity. Alberta Innovates Bio Solutions (AI Bio) is helping to fund research that will identify potential impacts that resource activity may be having on biodiversity and what can be done to mitigate those impacts. It has supported the creation of two Alberta Biodiversity Conservation Chairs at the University of Alberta, which have been filled by Dr. Stan Boutin and Dr. Scott Nielsen, who are professors in the Biological Sciences and Renewable Resources Departments. The Chairs are the research arm of the Alberta Biodiversity Monitoring Institute (ABMI), a program unique to North America that is designed to look at how biodiversity is changing the landscape as activities unfold. “The ABMI can tell us that a species or biodiversity in general may be declining because of our activities, and then we need to find out whether that is in fact the case and what we can do to change the activities,” says Dr. Boutin. Dr. Nielsen adds that Alberta is experiencing “unprecedented changes” in its landscape, and trying to find solutions is important for sustaining the province’s international reputation and its biodiversity. Industry, through Canada’s Oil Sands Innovation Alliance (COSIA) has teamed up with AI Bio, as well as Alberta Innovates Energy and Environmental Solutions (AIEES), the University of Alberta, and the province through Alberta Environment and Sustainable Resource Development to support these Chairs. While Alberta has put the ABMI and the Land-Use Framework in place, there is no dedicated science capacity to test cause-and-effect relationships related to the monitoring information that ABMI generates. Research is necessary to support policy decisions and to ensure that industry has the information it needs to develop and implement solutions. “The Chairs are an approach to build the collaborations to make that happen and to communicate solutions to the public and industry,” Nielsen says. They are also the hub of a broad-based research program that will extend the province’s research and innovation network. The Alberta Biodiversity Conservation Chairs will focus on key biodiversity challenges related specifically to the energy sector with a number of projects under four research themes. These are: rare and endangered species monitoring and conservation; cause-and-effect assessment of biodiversity changes as the foundation for effective management; improved monitoring, modeling, and management of biodiversity for land-use planning; and integrated restoration from site to landscape scales. One issue the Chairs will work on through research projects that is of particular interest to industry is woodland caribou conservation. Industry wants to reverse the decline of herds and is interested in options it can undertake on its own. Dr. Boutin will design a number of experiments to test the effectiveness of various strategies. 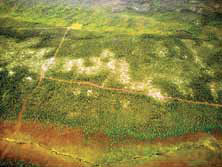 Seismic lines, which are common in Alberta’s forest environment, are known to have a negative impact on caribou populations because they increase habitat for moose and white-tailed deer, which increases the populations of predators such as wolves. Dr. Nielsen is leading a project to understand patterns of natural reforestation of seismic lines and what can be done to speed recovery. The project will result in software that categorizes areas and tells decision-makers where they should focus restoration efforts to achieve the most benefit to the forest and the caribou. The research work conducted by the Alberta Biodiversity Conservation Chairs is expected to have a number of positive outcomes. These include providing industry with objective scientific assessment and analysis of various issues that will lead to innovative solutions, and increasing research capacity in Alberta. It will also give stakeholders a forum to exchange and discuss scientific information; develop research partnerships between government, industry and academia; and develop the next generation of talent in the area of biodiversity conservation. What are the most efficient ways to process woody biomass at the source so that it can be transported to end users efficiently and economically? At the same time, can it be processed and transported in a form so that end users can convert the woody biomass easily into a variety of potential end bio-products like briquettes, pellets, biochar, bio-oil or activated carbon? These are questions that the Canadian Wood Fibre Centre (CWFC) will try to answer with two field trials later this spring; they are aimed primarily at investigating whether densification of woody biomass at the source is a step in the right direction to making the transport of woody biomass from the source to the end user more economical. These case studies will be held in northern Ontario and Nova Scotia as part of the first phase of CWFC’s “Innovative Woody Biomass Mid-Supply Chain Optimization” research program. Both trials will include the use of innovative and novel equipment like on-site densification units, processing various types of woody biomass. Each trial will use biomass harvested from short rotation plantations and woody biomass residue from harvest block landings that would be regularly disposed of by burning. “The goal is to investigate portable systems that will economically handle woody biomass so that we are transporting as much process-ready material in a truckload as possible,” says Tim Keddy, CWFC Wood Fibre Development Specialist. He adds that they are also considering the variety of end products that can be manufactured from the woody biomass and investigating various on-site processing and densification methods that will deliver a raw material best-suited for manufacturing a particular product. “The purpose of our research is to try to link woody biomass harvesting and processing options to the end product, and to develop an entire system that determines the best mid-supply chain options for delivering woody biomass in a format that best suits the production of specific end products in the most cost effective manner,” says Keddy. “And we’re not just looking at using woody biomass to create heat and power anymore.” He added, however, that heat and power have not been ruled out either if that is the most appropriate use of the densified woody biomass in some areas. One densification system that will be investigated is the production of densified cylindrical biomass ‘logs’. They can be produced in a variety of lengths depending on transportation requirements. To produce the densified logs, the woody biomass will first be ground up to approximately 3” diameter chips using a horizontal bed grinder and then passed through a dryer to achieve the desired moisture content. During the densification phase, a hammer mill further reduces the material to a size that will allow for its compression. The final step is to compress the material, using the wood’s own resins as a binding agent to produce the densified log. As part of its work in Nova Scotia, CWFC has partnered with researchers at the Verschuren Centre at Cape Breton University (CBU) and BioEnergy Inc. in Sydney, who together have developed and tested novel equipment to produce briquettes, torrefied pellets, bio-char, bio-oil and activated carbon from woody biomass. Their experience will assist CWFC in determining what type of feedstock characteristics work best for the manufacture of particular end products. This is allowing CWFC to conduct its research from the perspective of first looking at potential end products, then working backwards toward the best and most appropriate technologies that should be used at the woody biomass source to produce a feedstock with the right consistency that is also economical to transport. As part of this trial, CWFC will also utilize CBU’s capacity to complete physical and chemical analysis of the woody biomass and the end products being produced. Video blogs of these trials will be available online as part of Natural Resources Canada’s Innovation Hub. Anyone interested in watching the densification field trails in real time can sign up for a quick video blog presentation that CWFC is offering as part of its research trials. For more information about these two field trials and to be notified about the live presentations, contact CWFC Wood Fibre Development Specialist Tim Keddy at (780) 435-7212 or Tim.Keddy@NRCan-RNCan.gc.ca or Derek Sidders at (780) 435-7355.